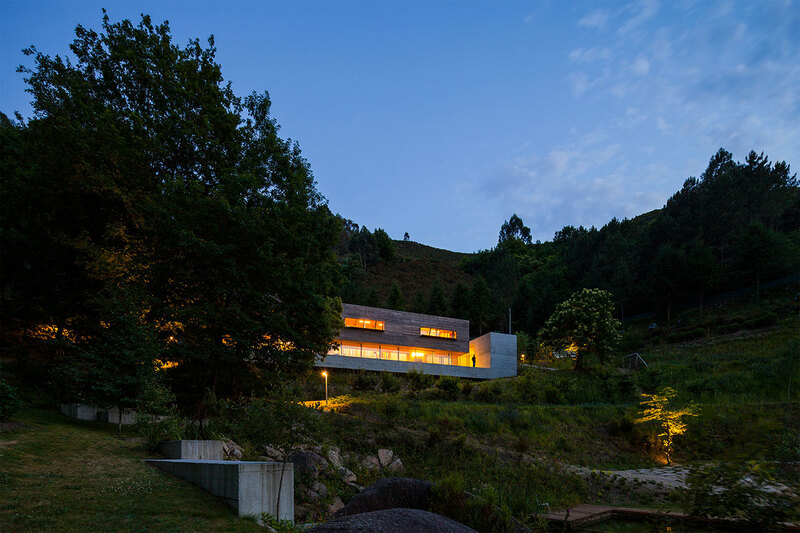 When the design team of Carvalho Araújo, Arquitectura e Design led by José Manuel Carvalho Araújo was given the design brief for Casa do Gerês in Portugal’s Caniçada Valley of Vieira do Minho, they had a few things to consider. 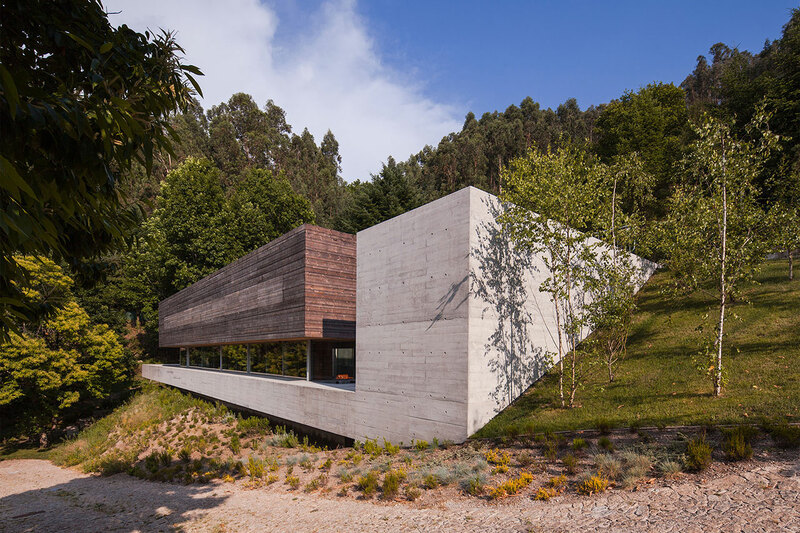 First, the steep slope of the hillside where the building was to be constructed had a propensity for small landslides - a factor which determined the demolition of a previous, smaller structure on the same spot - and second, their client, José Maria Marques Ferreira, desired that the nearby winding stream, as well as the breathtaking views, were to be taken advantage of in the new home's design. The building was finally completed in 2015 to these exacting specifications. 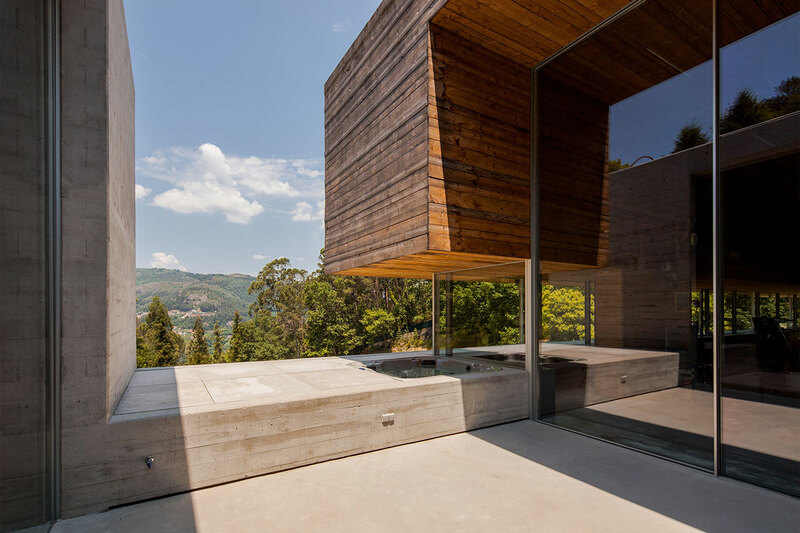 Simple lines, a clean, lean sense of structure and basic materials all conspire to make Casa do Gerês both an intrinsic part of the land as well as a breathtaking landmark that stands out. What could have been a liability, i.e. 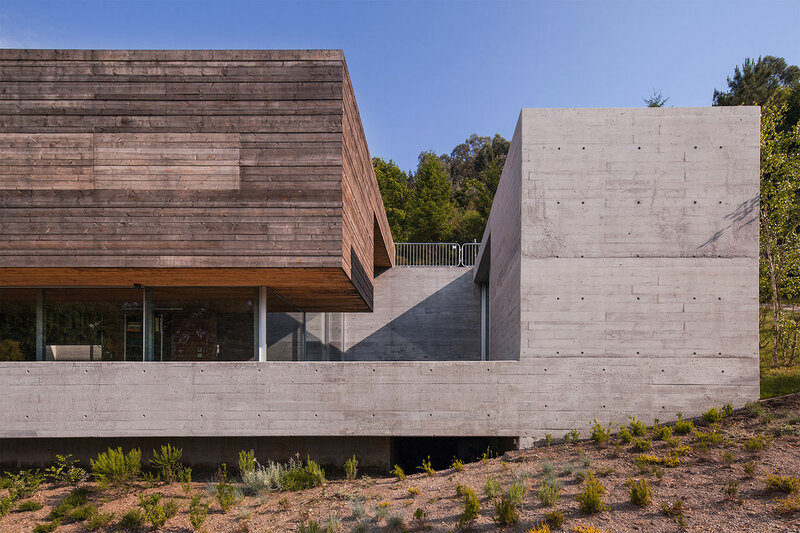 the steep sloping hillside, was turned into an asset, whereby the home is nestled into the hill like two perfectly fitting building blocks of concrete and wood, its two levels resting on each other as the wood "block" fits into the concrete "block" that extends beyond the lower level's water line. The dramatic entrance into the home itself is located at its top level. 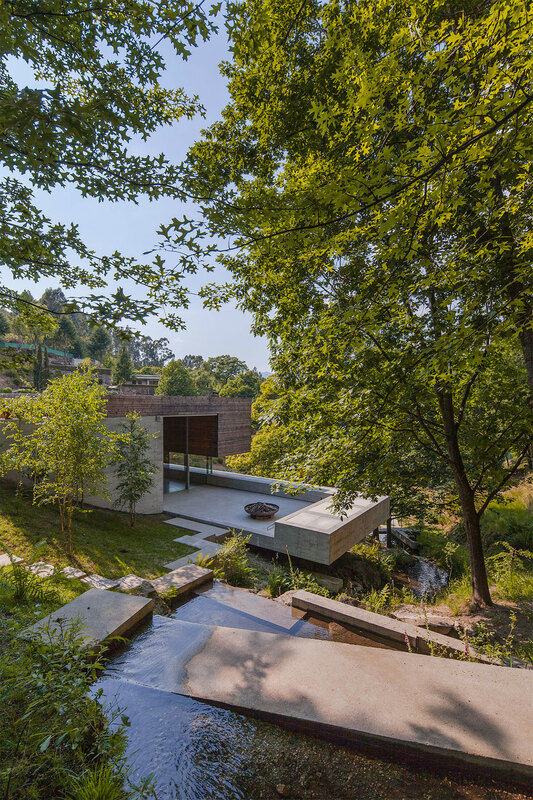 Beside it, the stream has been incorporated into the lush, yet wild landscaping in the form of a concrete "pathway" that guides the stream down the slope towards the small "lake" located below the home. 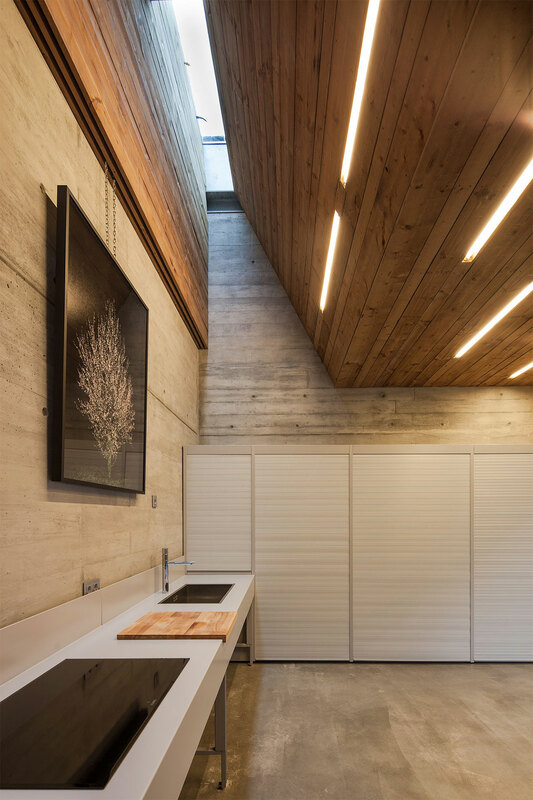 The wide concrete terrace embraces the view, visitors and residents alike and is the perfect prelude for the home's interior. 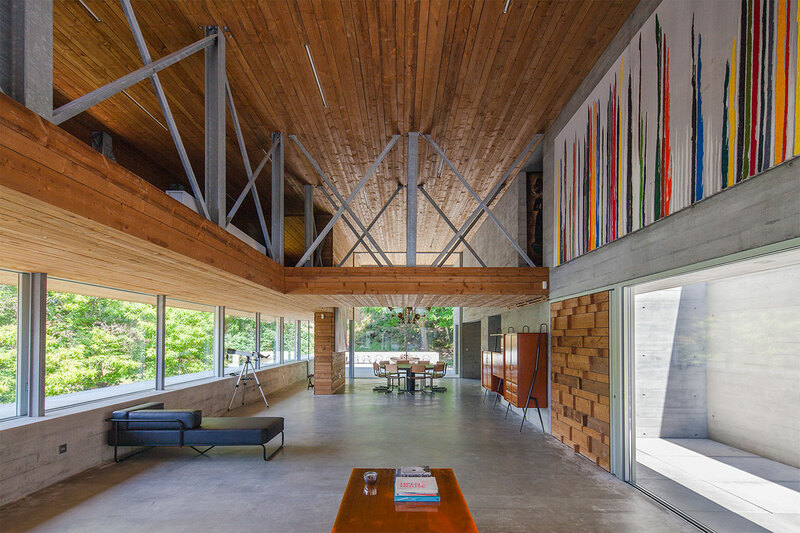 Once inside, the exterior of the structure is reflected in the monolithic, cast cement walls and floors as well as the wood paneling that makes its appearance sheathing ceilings (and some walls). The immense, all-enveloping glass windows assure that outside is welcomed in and that ample sunlight is a characteristic décor element. The rest is just as minimalistic, with leather daybeds, simple wood tables and recessed lighting, all highlighting but never encroaching on the open space of the rooms' flow. 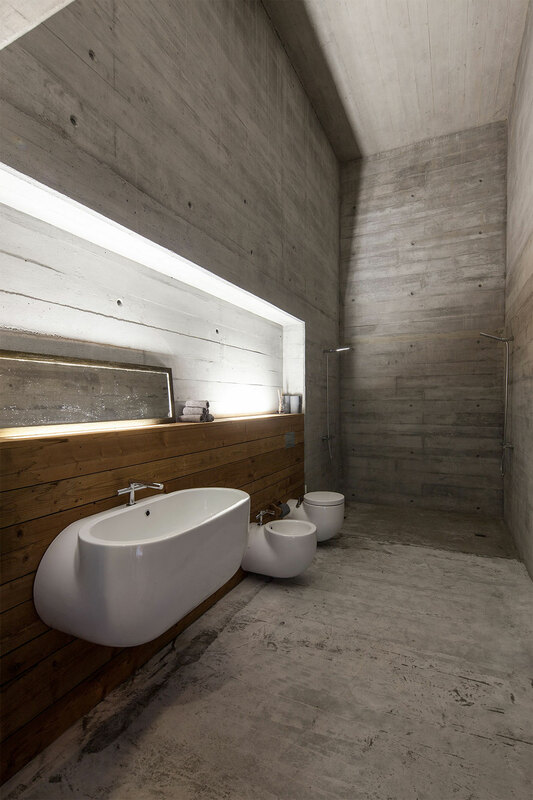 The no-frills, white cement bath and kitchen accoutrements perfectly complement the same aesthetic and allow for the basic construction of Casa do Gerês to make all the necessary statements. 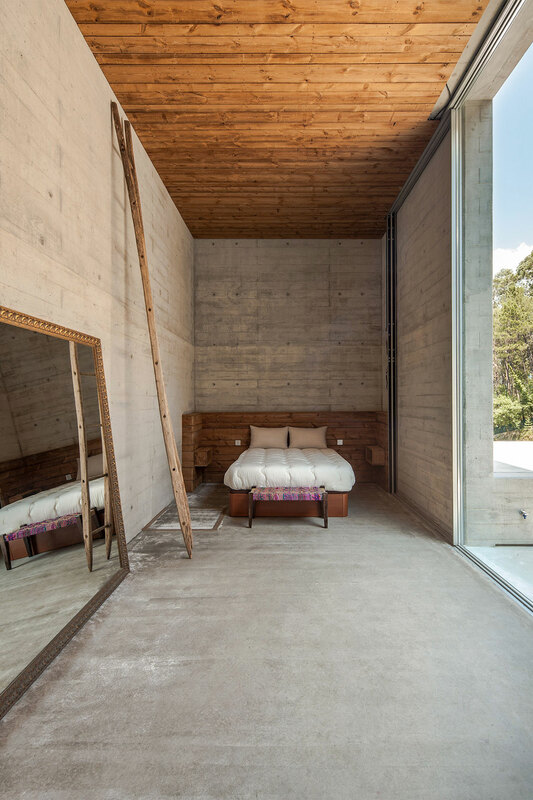 Upstairs, the private rooms are kept just as minimal with wood sheathing surrounding one of the bedrooms, while just a small panel above the huge bed is needed in another room to add a touch of cozy, soft warmth. 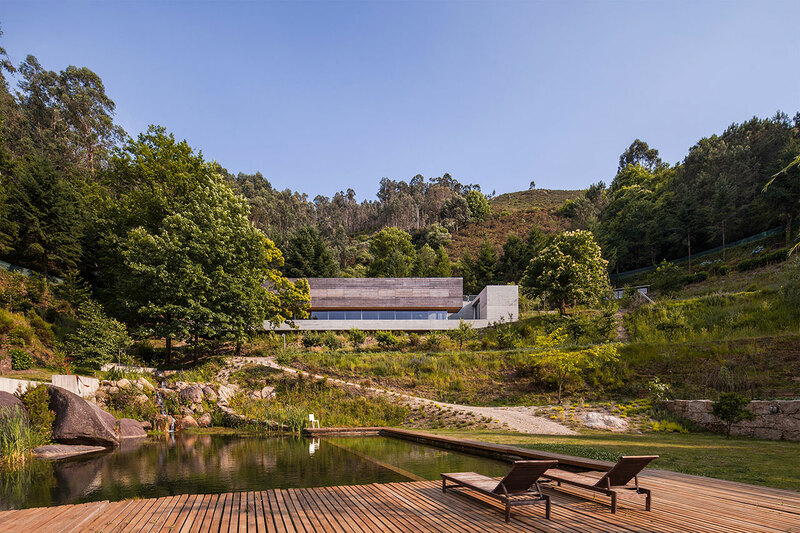 Casa do Gerês is one of those structures which just go to prove that uncluttered space is one of the basic design luxuries we don't know that we’re actually yearning for, until faced with such a fine example.